We are a 4500 sq.ft. family owned quilt shop in the heart of northern New Jersey and have been serving our customers for over 30 years. 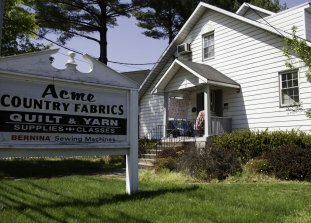 Our store is primarily a quilt shop but we sell a little of everything ..... fabrics, threads, notions, books, yarn, wool, upholstery fabrics and so much more! You never quite know what you will find here! We are an authorized BERNINA Dealer and have a wide selection of models on display at all times from sewing machines to embroidery machines to sergers. Our staff all own BERNINA'S too and are always available to help with any questions you may have and provide support to help you with your new or 'new to you' machines. Our resident technician services and repairs all makes and models of machines with a quick turnaround. We also sell sewing cabinets - Horn, Koala and have some models on the floor. Our prices are always very competitive in today's market. So if you are in our area stop by to see us and maybe demo one of our machines or take one of our classes or just stop by to chat ..... we love to take time with our customers and if you need help with a project we will do our best to assist you.